NAC has been on the cutting edge of building automation technology and a leader in automation since 1984. Customers choose to work with NAC because we understand the importance of effective controls design, efficient project management, and effective coordination with other trades to meet tight deadlines. NAC will customize an automation controls system for any project size or building type so that it is tailored to meet the unique needs of each customer. We believe your automation system should provide a return on your investment, and NAC makes that happen. As a systems integrator, NAC has the tools and experience to optimize your building’s performance to lower your energy bills, increase comfort, improve indoor air quality and minimize your carbon footprint. NAC offers a comprehensive selection of the latest in automation products and technology. We’re an authorized dealer of Alerton systems and software including IBEX, BACtalk (BACnet system), Webtalk (web-based system) and Compass Ascent (web-based HTML5); Johnson Controls Facilitator (BACnet and N2); and Tridium Niagara AX technologies. 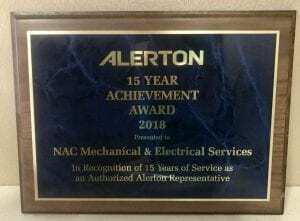 NAC also has the expertise to service and integrate with nearly every major automation system including Johnson Controls, Honeywell, Siemens, Trane, TAC, Novar, Trend, Delta, Distech, American Auto-Matrix, Barber Colman, Andover, Invensys, KMC, Automated Logic, and Siebe. For a full list check out our distribution page. Contact NAC to learn if we can integrate with your system. NAC has been a leader in BACnet integration for years. We have completed over $100 million in projects that include integration into competitor systems. By unlocking their proprietary system, we save our customers time and money. NAC has earned the trust and respect of building and project owners through our emphasis on project satisfaction and Customer Service-First philosophy. We provide automation customers with continued service and maintenance of their automation system, 24/7. Contact NAC to find out more about our automation or to schedule a no-cost assessment of your systems with one of our certified automation professionals.